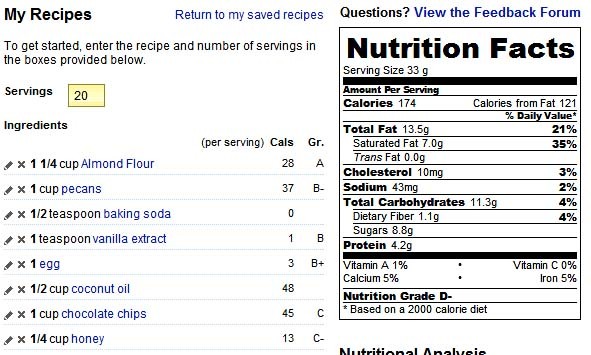 Ok, I know what you all are thinking…what in the world is going on with this recipe?!?! I am always on the hunt for new breakfast foods to make for my husband. He works very long shifts and a few years ago I decided to try and make him a hearty breakfast before work. The thing is about my husband is he hates scrambled eggs and very “eggy” things. He blames it on mono he had back in high school. Since then, the thought of scrambled eggs makes him a little sick to his stomach. With that in mind, I am pretty creative on my egg bakes and other breakfast foods I have made for him. 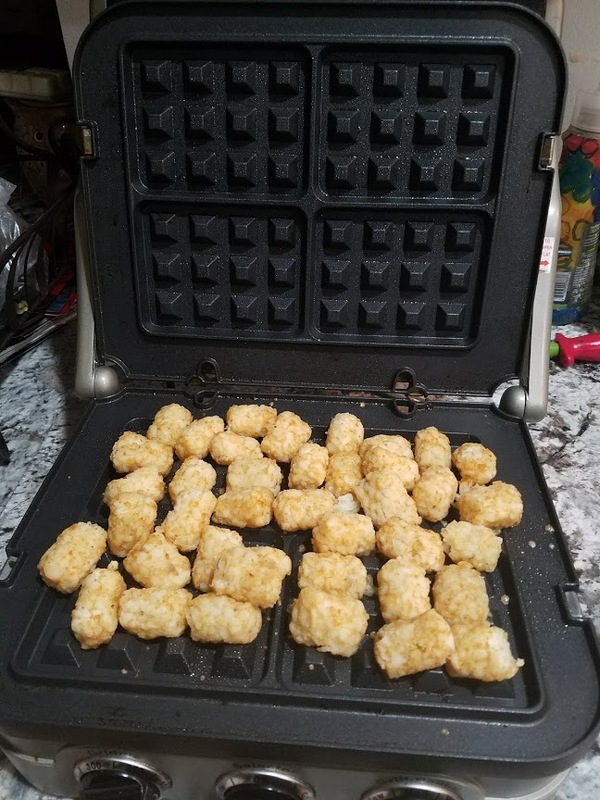 I’m a huge fan of tater tots in the waffle maker. Not tried it? I suggest you do because it is delicious! 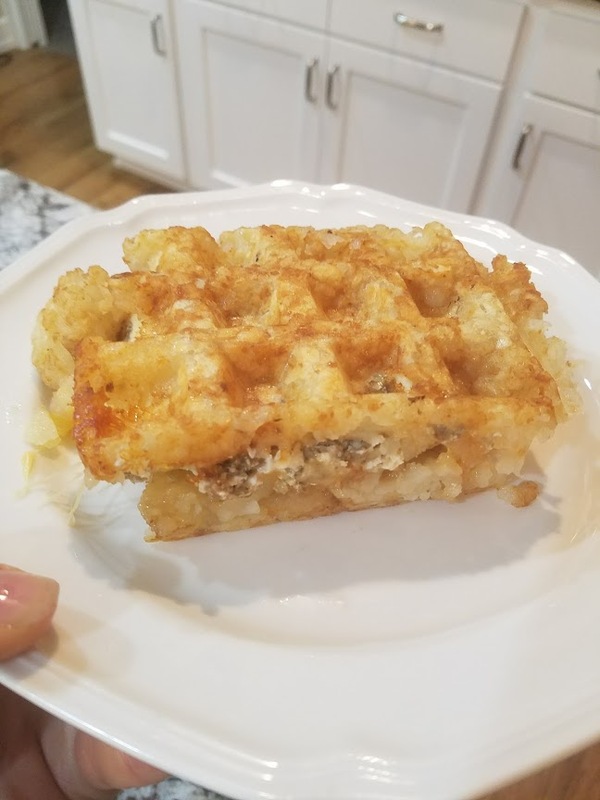 I sort of think of it as a poor man’s easy potato pancake….err waffle. I serve it sometimes with a side of apple sauce, just like a normal potato pancake. 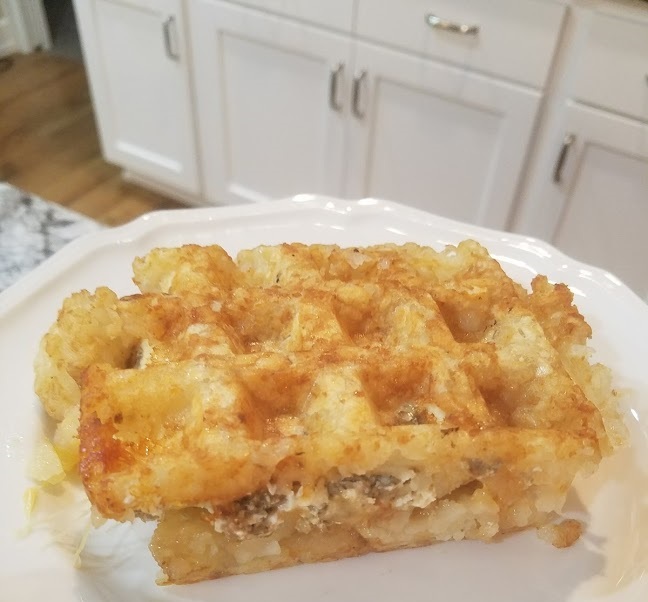 Back to the recipe…I was trying to think of a way I could make a sort of egg bake without that scrambled egg texture and I decided a loaded waffle with tater tots might work. This recipe was a complete experiment but it turned out awesome!! I baked the eggs at 400 degrees for about 15 minutes until the yolks were set in the middle. I put them in the refrigerator that night and also place 1/2 bag of tater tots on a plate to thaw. The next morning I turned on my waffle maker. Sorry, break in this blog. Let me rant about my waffle maker for a bit. For Christmas two years ago I asked for the Cuisinart 5-in-1 Griddler. 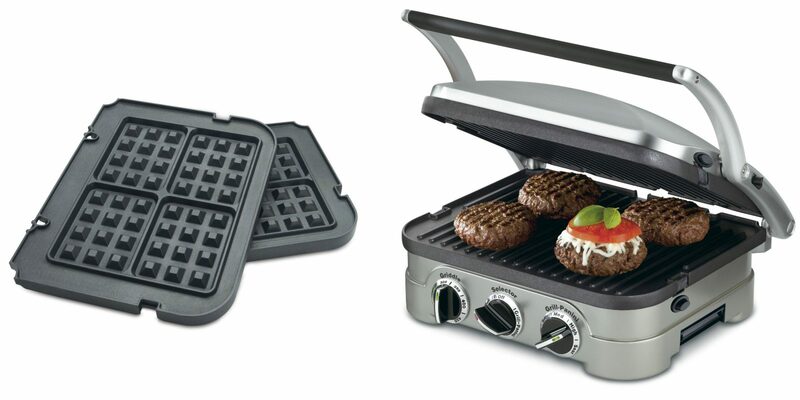 It’s a grill, griddle, panini press, and waffle maker (if you buy the waffle plates) in one! It might be one of my favorite kitchen appliances. I use almost every function of it all the time and it heats up so quickly! 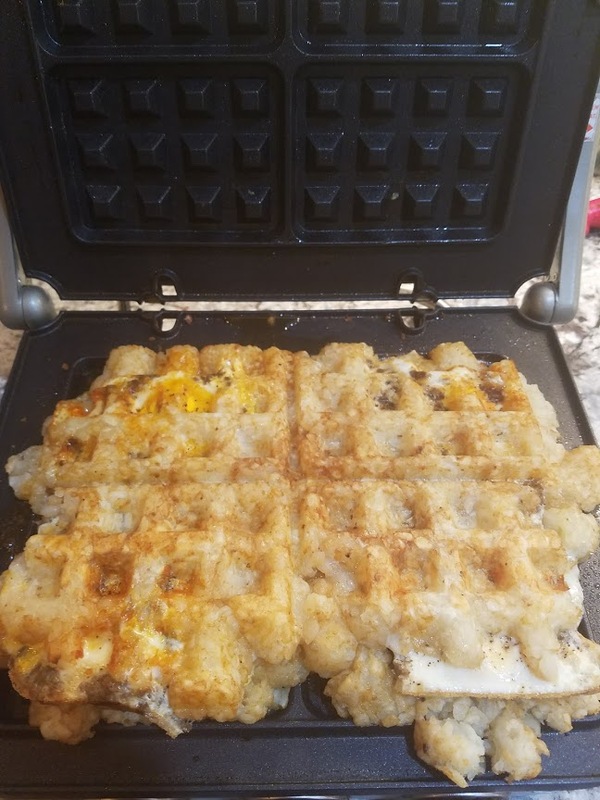 The next morning I turned on my Cuisinart 5-in-1 Griddler with the waffle plates and sprayed it down with some cooking spray. I filled the bottom plate with tater tots (leave some space, they will squish down). 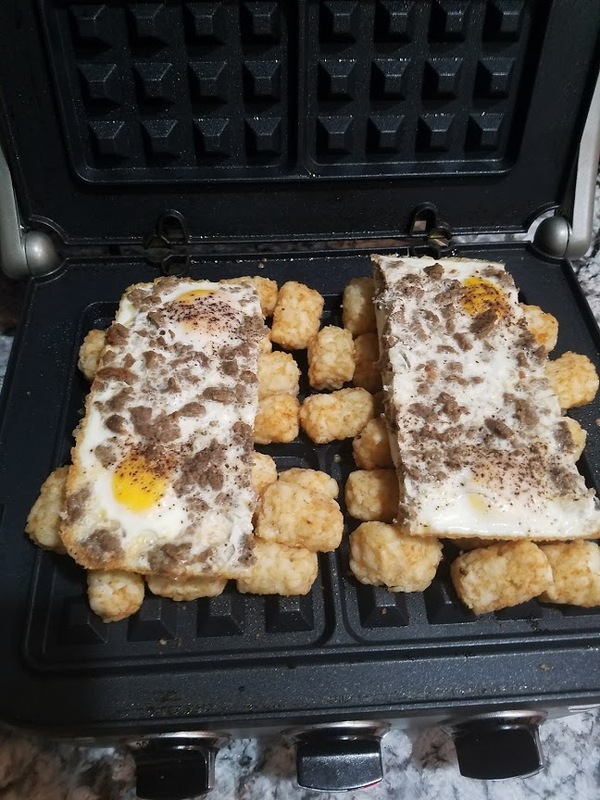 I topped the tots with the cooked eggs (cut in the rectangles) and a slice of cheese per egg. I did half pepperjack and half colby cheese. Then I topped the egg and cheese with more tater tots. I closed the lid and pressed down tight to press everything together. 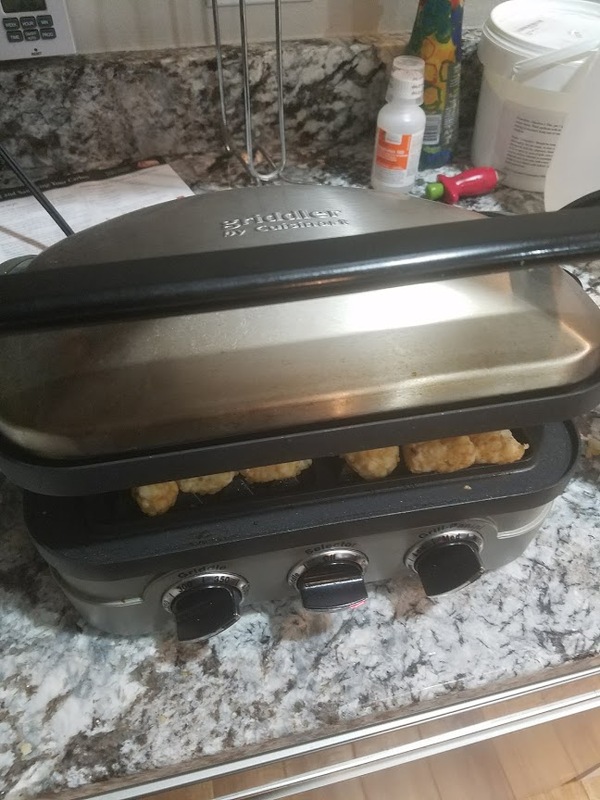 I let it cook for 5 minutes until the tater tots were crispy. Using a spatula, I carefully removed the Tater Tot, Egg, & Sausage Waffle and placed it on a plate. Hubby raved and raved at how good this breakfast was! Overall, it was a super easy breakfast to make in the morning. I am always a slow to wake up person, so making this hot, tasty meal in less than 10 minutes in the morning was a win for me! Hope you enjoy! A 10 minute morning breakfast that puts a spin on the traditional egg bake. Grease small baking container. 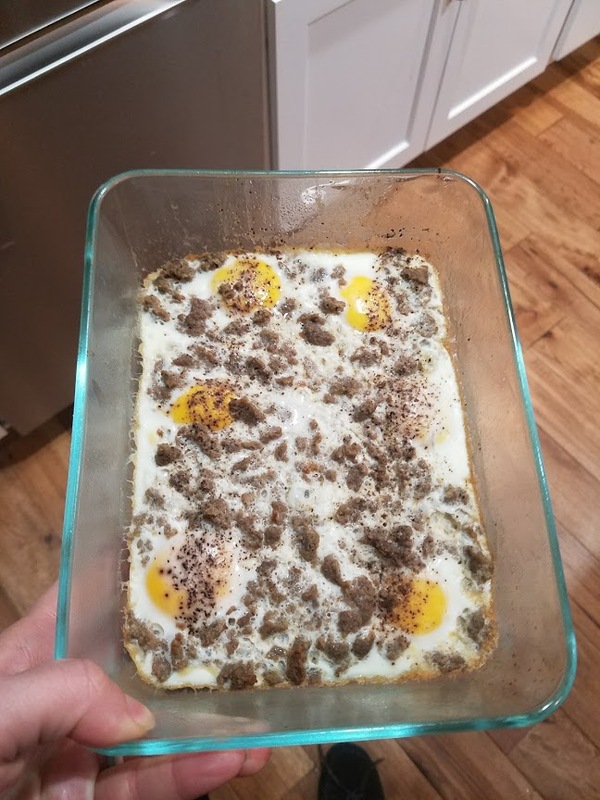 Crack eggs into container. Sprinkle with bulk sausage, salt, and pepper. Cover with foil. Bake at 400 degrees for 15 minutes or until yolks are set. Layer frozen tater tots on large plate. 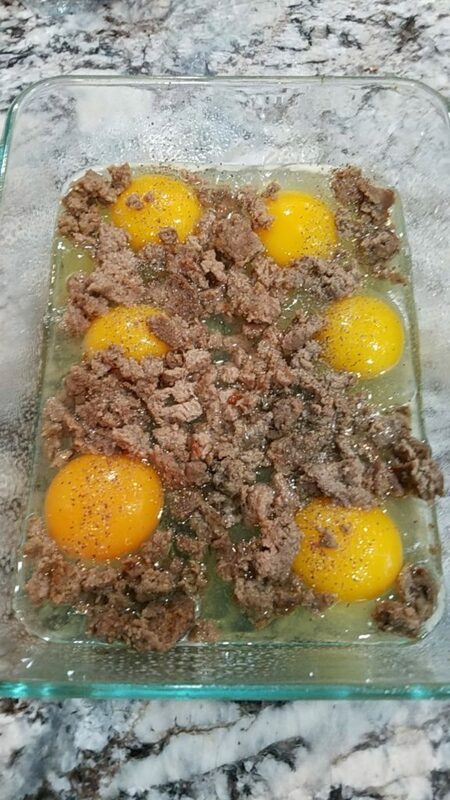 Cut cooled eggs into rectangles or squares. Place cooked eggs & tater tots in refrigerator overnight. Heat waffle maker so it is hot. Spray waffle maker with cooking spray. Fill bottom plate with tater tots (leave some space, they will squish down). Top the tots with the cooked eggs (cut in the rectangles) and a slice of cheese. Top the egg and cheese with more tater tots. Close waffle maker lid and pressed down tight to press everything together. Cook for 5 minutes until the tater tots are crispy. Using a spatula, carefully removed the Tater Tot, Egg, & Sausage Waffle and placed it on a plate. 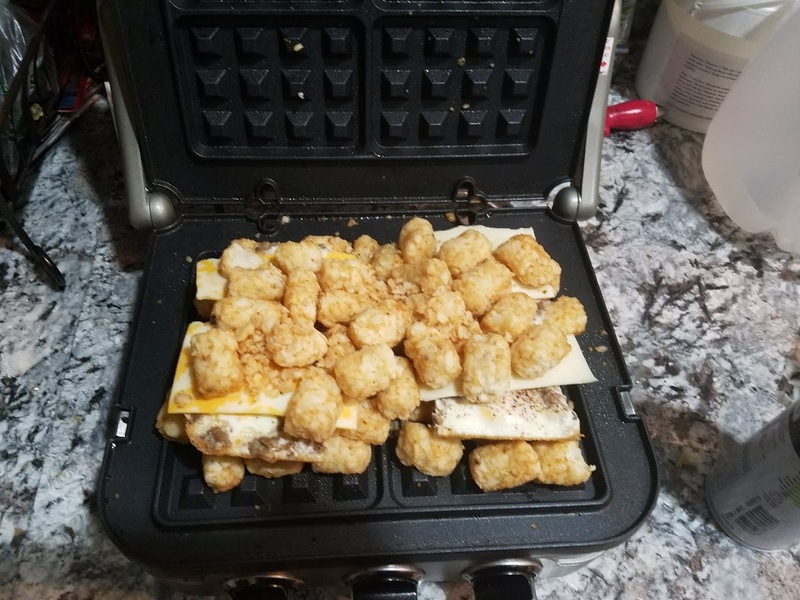 If you have problem getting the tater tots to come out of the waffle maker, you can add two layers of cheese. One before the eggs and one after the eggs. It will allow the tater tots to stick more together. 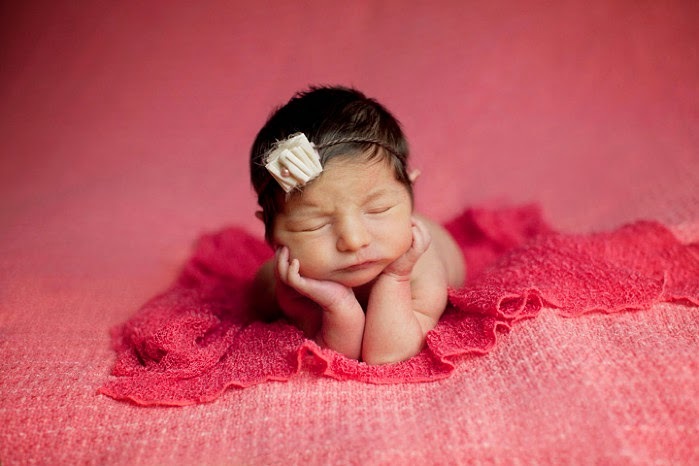 I know it’s been a while since my last blog….at least 6 months….but life sometimes gets in the way. I have been very busy chasing around 2 children under the age of 4, planting a huge garden (over 20 tomato plants! ), moving wood chips to my flower beds (150 feet of flower beds! ), numerous vacations, and so much more! 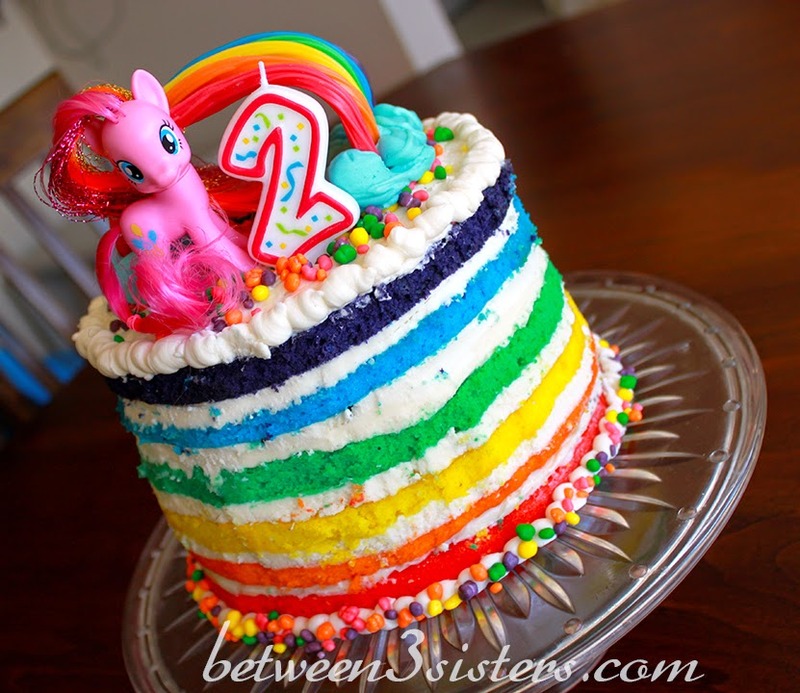 I used the Pillsbury Bold Funfetti Cake mixes to create the colors. I had to split the orange and blue to make the colors red and purple. I frosted each layer and really felt that if I did the outside it would be WAY too much frosting. I added a #2 to the top for her birthday! 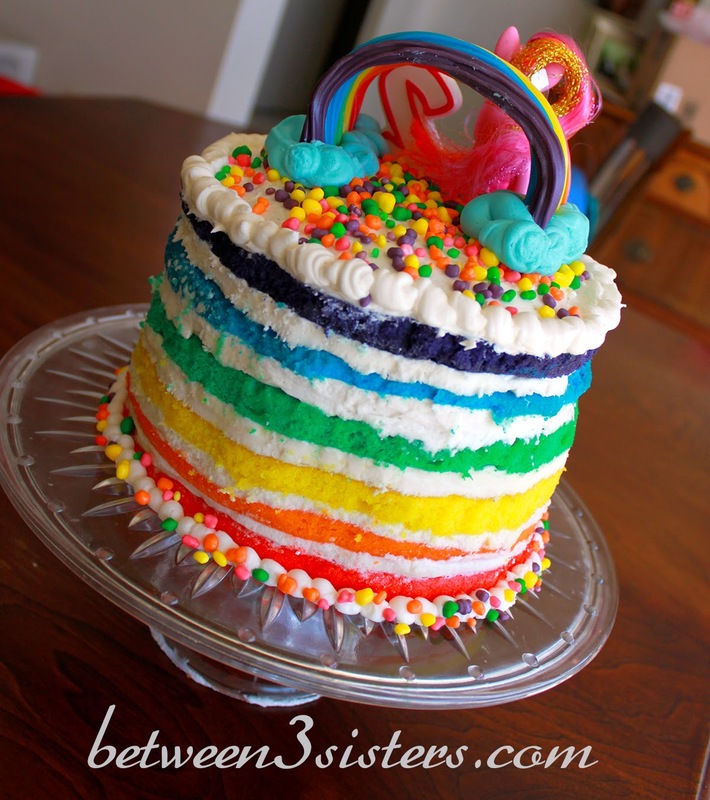 The top is made with Nerds and Rainbow Twizzlers, carefully held in place by toothpicks. Overall, I think it might rank up there with some the best cakes I have made! Thanks for checking out our blog and look for more of my summer projects coming up! Yesterday was my birthday. I won’t tell you how old I am, but all I will say is I am closer to 40 then I am to 20! With that being said, I feel like this year, so far, has been a bunch of non-stop trips away from home for our family. Now I am not complaining about this, but I have a big problem with controlling my food intake while not at home! 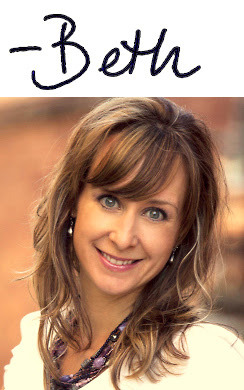 Our next getaway is scheduled 3 weeks from now and I am determined to shed the baby weight before that trip, so I have resorted to something I have never done….follow a diet plan! Without going into too much detail (and maybe I will at a later date if I have success with this diet) I am trying one of those crazy ‘low carb’ diets. 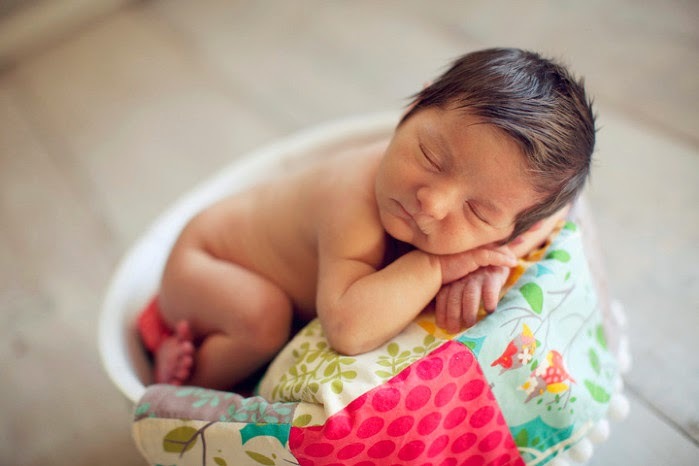 And now back to my birthday and the whole reason for this blog –every year for my birthday I have the same thing. A chocolate box cake with a chocolate can of icing. My husband tried for many years to go all out and make me some sort of fancy cake, but I kept telling him that all I wanted was “a box cake and can of frosting”. Since I am trying to stay low carb’d (under 40 grams a day) I told him to go crazy with making me a “low carb” cake and this is what we came up with. He made the base and I made the topping (because I wanted more chocolate….it’s my birthday after all!) 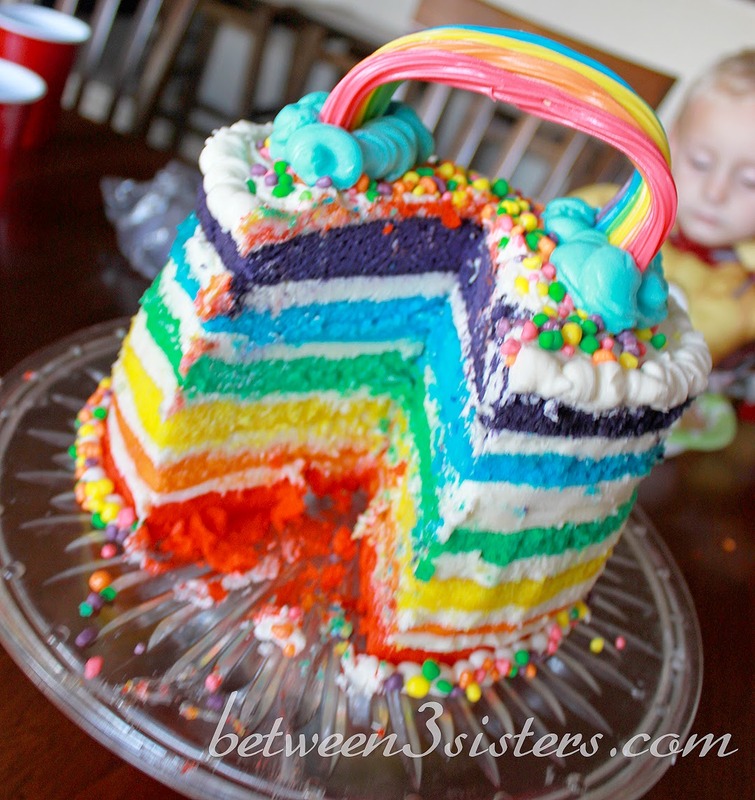 This cake to some people would not be the lowest carb cake out there, but you know what…it’s good! The nutty pecans give a great flavor to the cake part and the semi-sweet dark chocolate mousse topping add extra decadence without going over on the sweetness. I find with many Splenda desserts I can only taste the Splenda and adding the mousse topping really balanced out the sweetness to feel like you are eating a full fattening cake! I hope you enjoy as much as we did! 1. Preheat oven to 350 degrees and butter a 8-inch spring form pan. 2. Process pecans in food processor until they are a powdery consistency without turning into pecan butter. 3. Add cocoa, baking powder, salt, and splenda to the processed pecans. 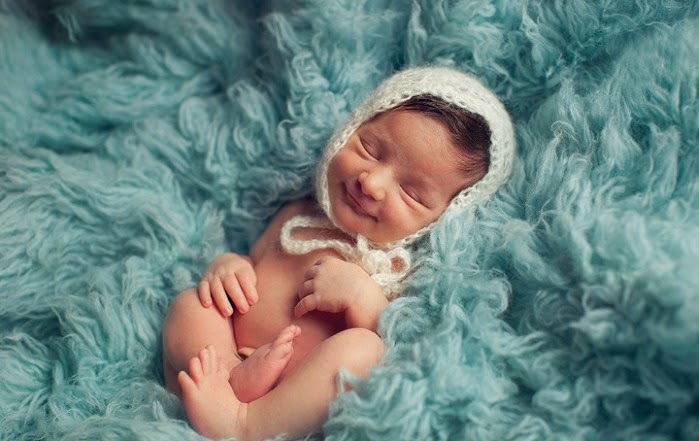 Stir until well combined. 4. Add the eggs, melted butter, vanilla, and water to the dry ingredients and stir well. 5. Pour into buttered spring form pan and bake for 25 minutes until toothpick inserted in center comes out clean. 6. Let cake base cool. Once your cake has cooled, begin the process for the mousse. 1. In the microwave or double boiler, melt the chocolate with the butter. combine well. Put whites in a cool glass mixing bowl. 4. Fold them in the chocolate mix and then pour mousse mixture over the top of the cake. 5. Store the cake in the refrigerator for 2-3 hours until the mousse is set. 6. 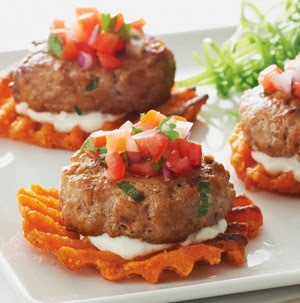 Slice and serve with a dollop of whipping cream or some sliced strawberries. Well we made it, February 2nd and it’s that Super Bowl kind of time right now. It’s also about one month past everyone’s New Year’s resolutions and if you are still keeping up with yours give yourself a big pat on the back! Did you know (according to statisticbrain.com) that the #1 New Year’s resolution is to lose weight? In the first week of January 25% of people quit their resolutions. And by a month later (now and Super Bowl) only 64% of people are still keeping their resolutions. Since losing the last 10 pounds of baby weight was #1 on my New Year’s resolutions, I thought making some healthy Super Bowl recipes this year might be just the thing needed to keep me motivated! (By the way I have lost 3.5 pounds!) Who knows, maybe these low calorie recipes will be better then the full fat ones and I might never go back! 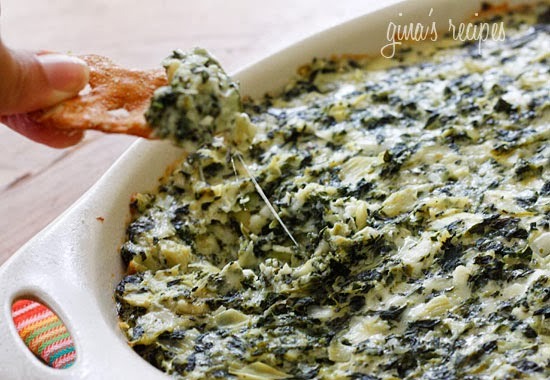 I plan on eating this yummy dip on some pretzel crisps! Instead of plating this dip, I am going to place it on top of a homemade, low calorie, thin pizza crust I make. Then I will slice it into triangles for easy eating! This one just screams football to me. 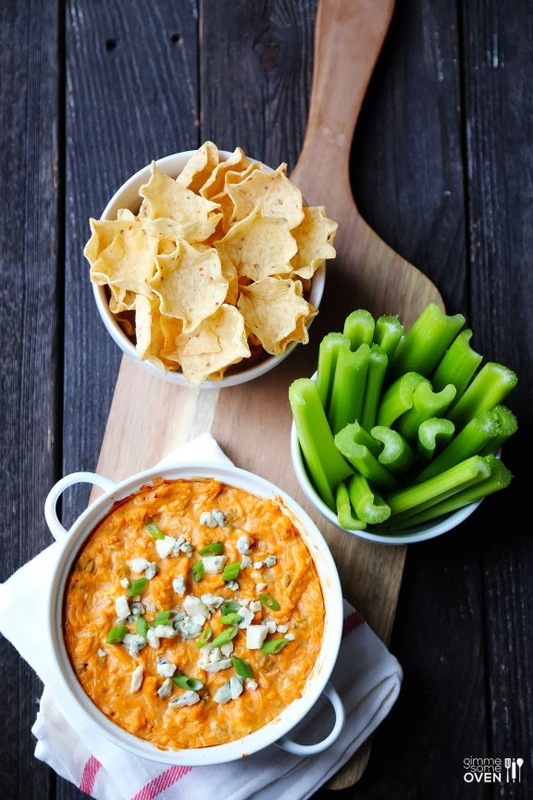 I really love buffalo dips with celery. I feel chips make it too salty most of the time. This is probably the main course of the evening. 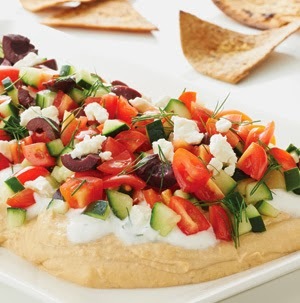 I personally LOVE dips so I have a hard time walking away from them, but variety is the spice of life! If anyone wants to join me in making these yummy recipes this evening, I have compiled the grocery shopping list (in order of department) in the link below. The other day I was shopping at Costco and picked up a box of these Quaker Soft Baked Bars for the kids (and me) to eat for breakfast. I am not going to lie, they aren’t that bad, but they are soooooo sweet! Too much sweetness for me to eat in the morning! This morning I decided to try creating my own version of a breakfast bar, but not a too sweet breakfast bar. Since it is fall I decided to go with one of my all time favorite cooking ingredients –PUMPKIN! 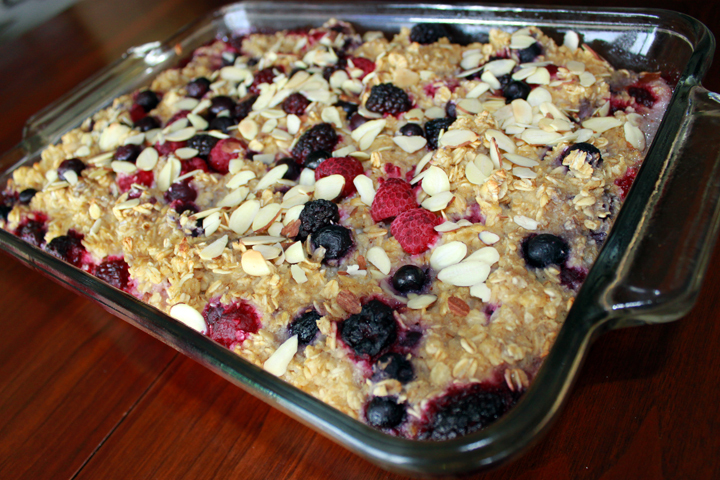 The best part of this breakfast bar recipe is that there is NO SUGAR in them! I guess that might be overstated a little. There may be no added sugar but they do have some sweet things in them to make them delicious, but not too sweet like the above packaged ones. The bars get their sweetness from pure maple syrup, dried cranberries, and 70% cocoa chocolate chips. 2. Grease a 9″x13″ inch pan with cooking spray. 3. In a large bowl combine pumpkin, maple syrup, cinnamon, and nutmeg until smooth. 4. Add oats, almonds, cranberries, and chocolate to the bowl. Stir well. 5. Press pumpkin oat mixture into the 9″x13″ inch pan. 7. Allow the bars to cool before cutting into 2″x2″ squares. 8. Store in a airtight container in the refrigerator. The Skinny: Serves 20 @ 144 calories each! My husband and I are in the middle of a 30 day Paleo Challenge. Adjusting to not consuming any processed foods (including flour) has been a little of adjustment for us, I LOVE TO BAKE! Of course, within reason…I make cookies every once in a while as a treat! I had no idea how to adjust baking without the use of flour, but luckily I have discovered the magical, wonder of almond meal! I absolutely LOVE this stuff! It makes a great substitute for real flour and adds a nice nutty flavor to everything I have baked. Here is a chocolate chip cookie recipe that I came up with after trying a few others out. 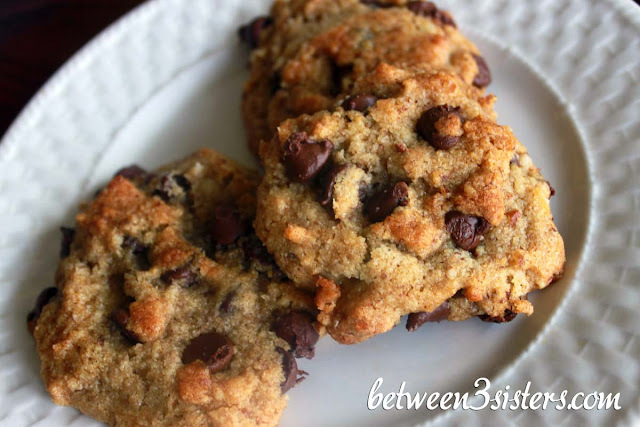 We love these cookies and they are pretty filling with the pecans and almond flour in them! 1. Mix almond flour and baking soda together. 2. Place pecans in a food processor and pulse until you get a very fine flour, but not so much you get pecan butter. 3. Add pecans to almond flour mixture with a fork and blend well. 4. In smaller bowl, mix vanilla, egg, coconut oil, and honey. 5. Combine the wet ingredients and dry ingredients with the chocolate chips. The dough will be really sticky. 6. Using a small spoon (I use a melon baller) spoon dough onto a cookie sheet. The size of the cookie should be about a heaping tablespoon. 7. Bake at 350 degrees for 10-15 minutes until tops are toasted brown. 8. VERY IMPORTANT -Let cool 10 minutes before picking up of they will fall apart. I love a good hot breakfast and when a friend made this oatmeal for our MOPS group I was in love! This oatmeal is the perfect balance of well cooked oats, with a hint of vanilla and cinnamon! 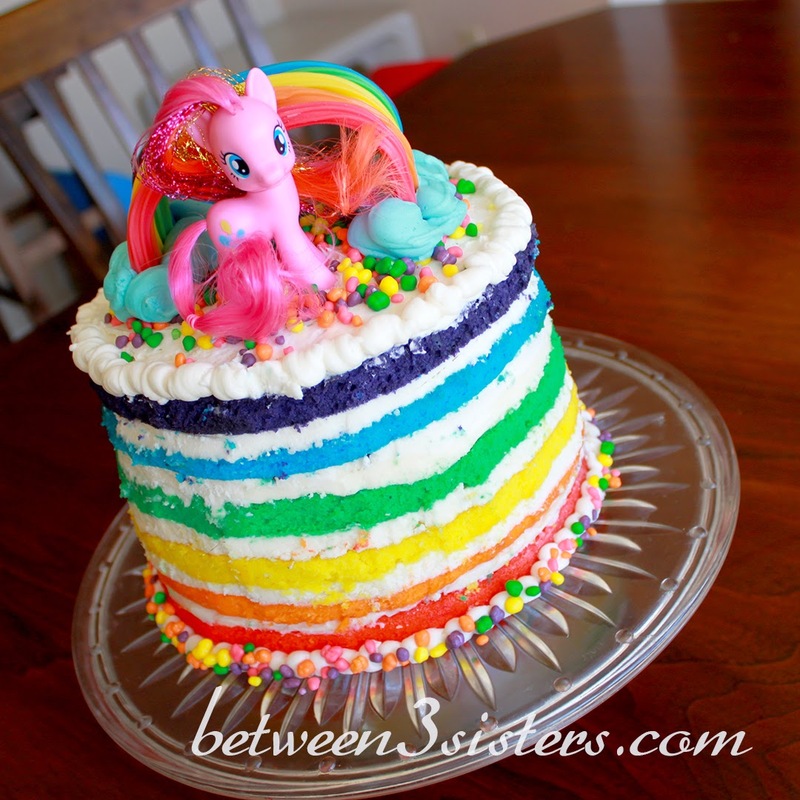 It is slightly sweetened, but not too sugary so everyone is sure to love it! It’s a great hot breakfast that you can prepare the night before and bake in the morning to give your family a healthy start to the day! 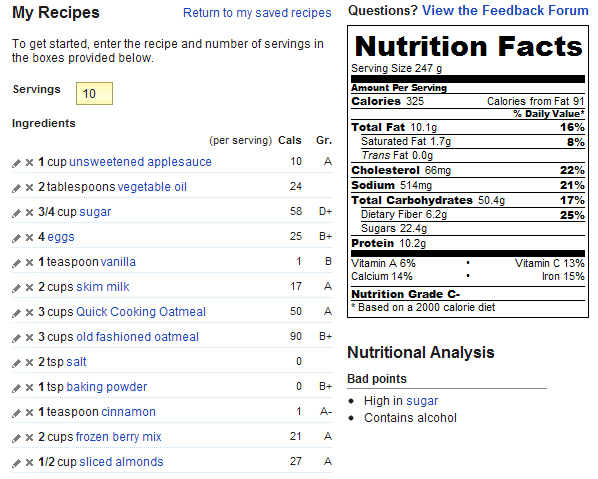 Best of all, it’s a hearty 325 calories per serving!! 1. 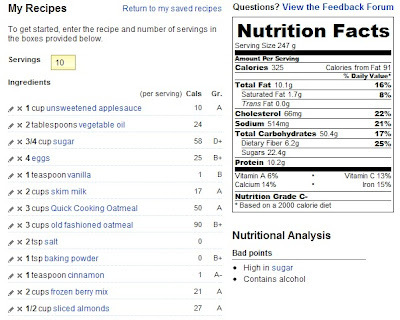 Mix applesauce, oil, sugar, vanilla, milk, and eggs in a large bowl. 2. In a separate bowl, mix together oatmeal, salt, baking powder, and cinnamon. 3. Combine dry and wet ingredients and stir until just blended. 4. Add the frozen berry mix and stir slightly. 5. Place oatmeal in a greased 9×13 cake pan and refrigerate overnight. 6. The next day, top oatmeal with almonds and bake at 350 degrees for 35 minutes. 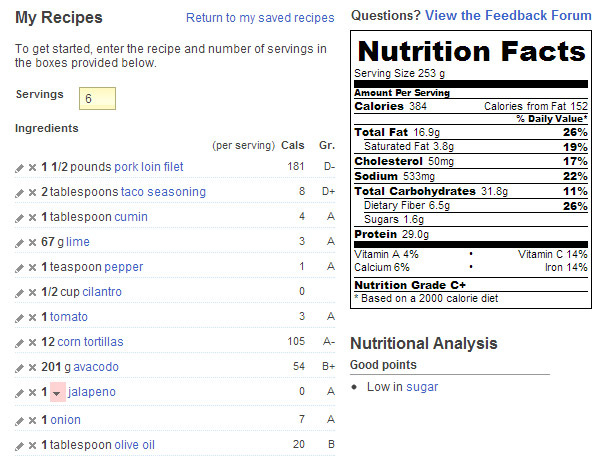 Everyone loves a good Mexican dish, but usually it comes with some SUPER high calories. Not these yummy Lime & Avocado Pork Tacos! 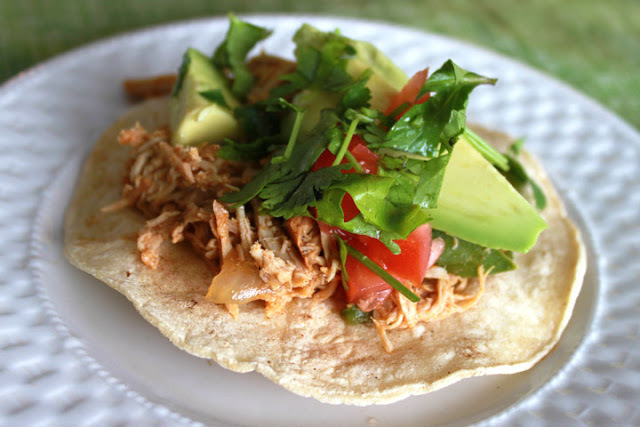 Cooking the meat in a crockpot helps retain the pork’s juiciness The lime adds just the right kick to compliment the spice of the jalapeno and buttery texture of the avocado. At 384 calories for 2 tacos, this will be one Mexican dish you will for sure repeat! 1. In crockpot, place pork loin and cook on low for 6 hours. Shred when cooked. 2. Heat a olive oil in a large nonstick skillet. Add pork, taco seasoning, cumin, pepper, 1/2 cup water, onion and jalapeño to pan; sauté 8 minutes or until tender. 3. While pork is cooking, heat oven to 400 degrees. Place corn tortillas on cooking stone or baking sheet and cook 5 minutes. Turn over and cook 5 minutes more. 3. Stir in cilantro and lime juice; cook pork until warm. 4. Serve tacos by topping corn tortilla with pork mixture chopped tomato, sliced avocado and some chopped cilantro. Enjoy! 1. Boil sweet potatoes or yams till soft. Mash together. 2. Mix mashed potatoes, 1/2 cup melted butter, evaporated milk, eggs and vanilla. Mix together and beat well. 3. Pour into a 9 x 13 pan. 4. Now make the topping. Mix brown sugar, flour, and pecans together. 5. Mix in remaining cup of melted butter (about 1/4 cup). Mix well. 6. Pour topping on top of potatoes. 7. Bake 40-50 minutes at 350 degrees. 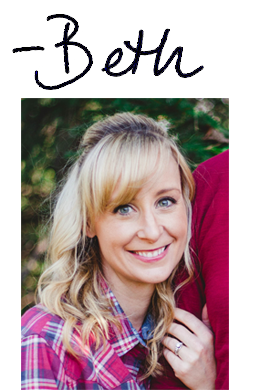 I am starting a series of blogs for Make Ahead Meals that I am preparing before Baby 2.0 arrives. Every night when I make dinner, I am doubling the recipe and putting the second in the freezer. I am hoping that the prepared meals will help on those totally exhausted days when cooking sounds like no fun. I am hoping many of the meals I will be preparing will be somewhat healthy and low calorie, but I know there will be some meals mixed in that aren’t. To prepare for the freezer meals, I purchased some slow cooker liners (for the crockpot meals), gallon freezer bags (for the freezer skillet meals), and Aluminum Foil Steam Table Pans with matching lids (for the freezer casseroles). I made this recipe a while back and it is now one of my husband’s favorite casseroles and he requests it all the time. Prepare rice pilaf according to package directions. I like this brand of rice pilaf, but I only use 1 seasoning packet as I find with two it gets too salty. In large skillet, cook the sausage, celery, and carrots over medium heat until meat is no longer pink. The veggies might be a bit crisp, but will cook down in the oven. In a large bowl, combine the soups, onion powder, garlic powder and pepper. Add mixture to the skillet full of carrot, celery, and sausage. Add in the rice pilaf mixture and stir. Add in cooked wild rice and 1 package of almonds. Grease two baking dishes. I made the meal that night, so used the smaller one for dinner and the larger one is for the deep freezer. Transfer the casserole over to the two dishes. Sprinkler top with remaining package of sliced almonds. And top with chow mein noodles. Cover and freeze one casserole for up to 3 months. I use tin foil on the top and then cover with the lid that matches the pan to prevent freezer burn. Label the freezer one to thaw, bake at 350 degrees for 40-50 minutes or until warm. For dinner that night, bake the remaining casserole at 350 degrees for 40-45 minutes or until vegetables are tender. Enjoy! !